Shirts With Random Triangles: Texas Tech at have multiple alternate helmet options in 2013? 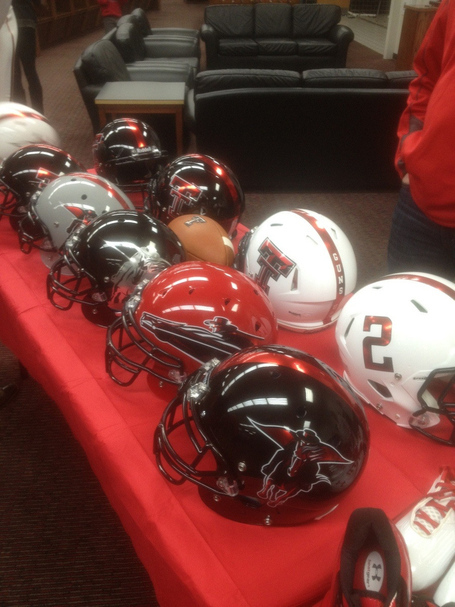 Texas Tech at have multiple alternate helmet options in 2013? Is Texas Tech ready to take the alternate helmet craze to the next level? A prospect attending the school's junior day over the past weekend posted this image of a selection of possible helmet designs for the upcoming 2013 season. The designs range from the classic "Double T" helmet to variations of the team's Red Raider mascot to an Alabama-style helmet with the player's number. There's no official word that any or all will be used next season, but as new Texas A&M head football coach Kliff Kingsbury is a known style innovator and former fashion model, it's a strong possibility that you'll see more than one of these helmets next season.